First, some old history. When I was an operational forecaster (many years ago), the practice of doing postmortems when the forecast went awry was common. A forecaster might even be assigned to do a quasi-formal, case study of a missed event (I know that I certainly did quite a few of these). Thus, I am a firm believer in the postmortem as a learning tool, that also helps build experience levels. I think that in operational forecasting today the postmortems can often (usually?) be summed up as: "The models screwed up." While I didn't state it explicitly, I thought that reasonable POPS for the area around the house were about 20-30% yesterday afternoon and evening, because of the very poor steering-level winds for this location, and a marginal looking morning TWC sounding. The WRF model was, however, very bullish on rainfall for low elevations. The NAM was not as aggressive, seeming to keep precipitation more toward higher elevations. Finally, at 8 pm, as in earlier post, I thought that the chance for rain had passed for metro Tucson. So, this post is about what I think may have gone differently than what I expected. Shown above are top: WRF-GFS forecasted 3 pm composite radar echoes from the midnight initialization; middle: same thing from run initialized at 1200 UTC; and bottom: the 1200 UTC run's accumulated rainfall at 9 pm yesterday evening. Both forecasts were reasonably good from the Rincons east (i.e., at higher elevations). But, the forecasts were not good for the Tucson metro region, nor for the lower elevations of the Santa Cruz Valley. Mike Leuthold is away on vacation, and I don't know if anyone is adjusting the PW in the model initialization - or, if he has this procedure automated. But I suspect that the initial low-level moisture fields (for both runs) were not as good as they needed to be. Further, again not mentioned in my posts yesterday, I noticed that the runs had early morning convection in our area - the convection moved rapidly northward and dissipated. But, this early error in the WRF forecasts may have impacted the rest of the forecast runs. I grabbed the forecasted 1 pm TWC sounding from the 1200 UTC run of the WRF-GFS and it is at top (just above). The model had forecasted PW into the range of 37 to 40 mm and there was substantial CAPE indicated. The model seemed to forecast enough CAPE that it initiated convection at low elevations primarily due to surface heating (note I don't have enough information to be sure of this). The model forecasted BL at 1 pm is about 100 mb too shallow, and considerably too moist - thus, leading to the forecast of low-elevation, strong thunderstorms. As far as I can tell, midafternoon PW was around 30 to 32 mm - about 5 to 8 mm lower than forecasted by the model. The 0000 UTC sounding taken at TWC yesterday afternoon is shown in the bottom graphic (from the Univ. of Wyoming upper-air page). The sounding analysis there indicates NO CAPE and a PW of 24 mm. So, we know that the WRF forecast sounding was too moist and, from GPS data, we know that the RRS TWC sounding was about 6 to 8 mm of PW too dry. An ugly mess! There was obviously some CAPE present in the BL over the metro area, that lingered through the night within an elevated mixed layer. 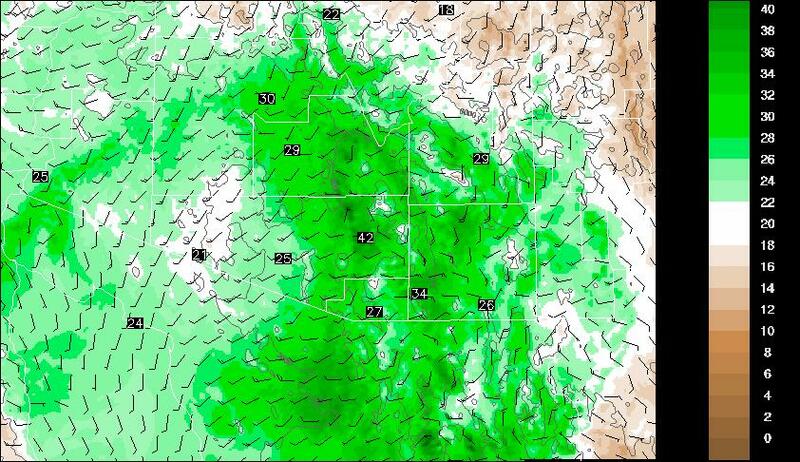 This CAPE was released when the outflow from Sonora converged into the Tucson region around around 3:30 am. Thus, my expectations were too high for the afternoon and evening and too low for the late nighttime. Yesterday's situation was confounded by the bad RRS sounding data, which have to be corrected by guess at the forecast office, using a sounding correction program (unfortunately I don't have access to such software and make subjective guesses through the summer to try to infer what the soundings should have shown). The PW has decreased markedly to the wesst of Tucson, as the 500 mb short wave moves across the Great Basin, with its tail crossing Arizona. 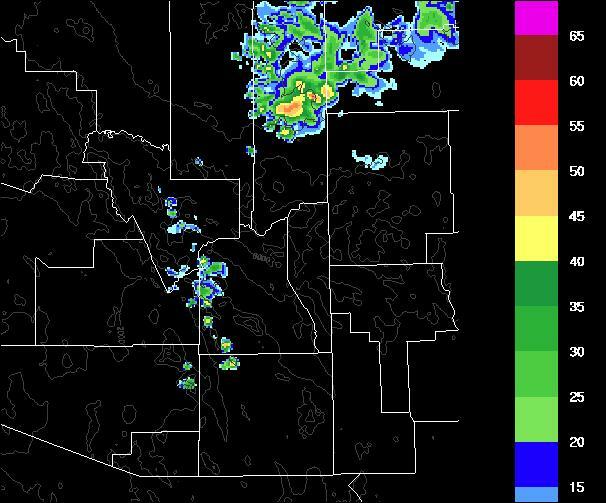 The WRF model forecasts the only convection in Arizona today to occur in Cochise County. Which seems quite reasonable. The 0.11" of an inch of rain in the yard here this morning will vanish almost in a snap-of-the-fingers, as the sun heats things up. Earlier posts for the next few days remain essentially on track - models differ in degree to which inverted trough (now associated with Arlene, which is now inland - see above) will push deep moisture into southern Arizona. The operational GFS now seems most agressive, but also appears to be an outlier. The WRF brings the moisture back quickly, enough so for thunderstorms again by Saturday. Basically, after a brief drying, an interesting Holiday weekend on tap. 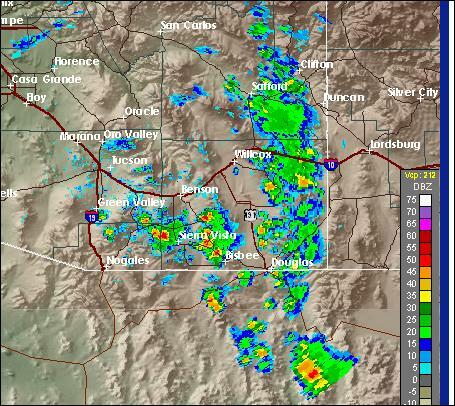 Thunderstorms yesterday afternoon tended to stay over the highest elevations and also to remain off to east of Tucson. There were several severe storm warnings in Cochise County; storms developed on the Santa Ritas and Rincons near Tucson. The 0000 UTC sounding from TWC appeared to have no CAPE, but it was too dry wrt GPS data, leaving the true situation a bit of a mystery. At 8 pm I observed frequent lightning from the southeast to the north-northeast and figured that that was that. 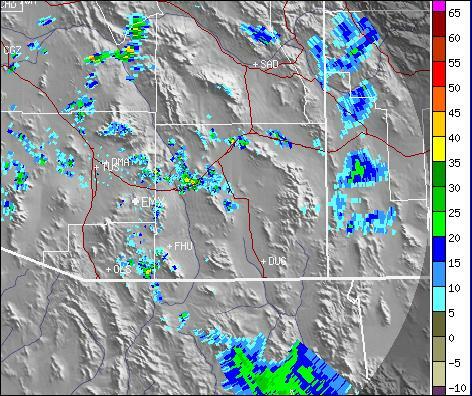 Shown above are the composite radar chart for 8:45 pm (MST) and the IR satellite image for 8:30 pm. These both seem to indicate that storms have once again avoided Tucson. 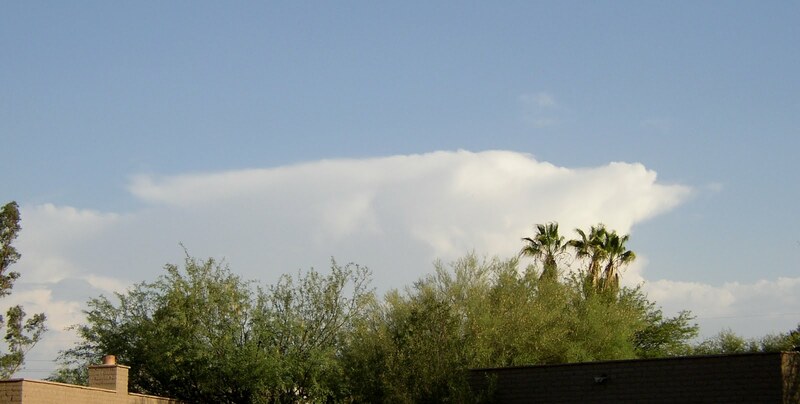 However, it is of some interest that the RAWS station at Guthrie had 0.25" of rain along with a gust to 61 mph - so that, along with a nearly coincident gust to 64 mph at the Douglas-Bisbee airport, we had the first severe thunderstorm reports in southeast Arizona for summer 2011. However, this morning at 4 am we were sitting on the front porch watching the rain and lightning flashes, and listening to rumbling thunder - quite a surprise to everyone. At top, just above, is the 3 am NWS Tucson base scan radar from NCAR RAP - still not much around of obvious interest. 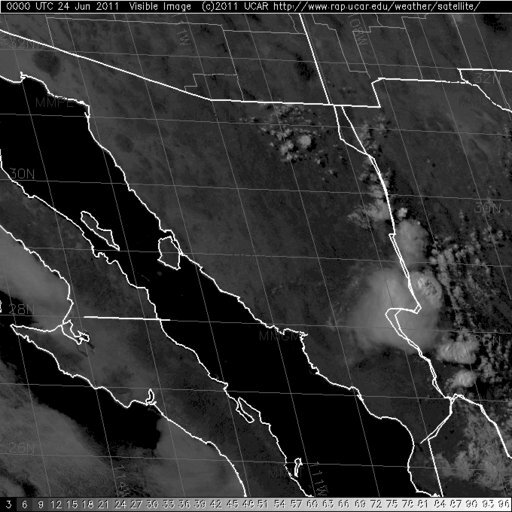 However, a convective complex in northern Sonora had again generated a northward moving outflow. 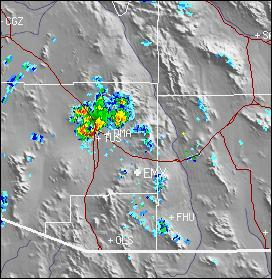 This outflow moved into the Tucson area and storms developed at low elevations in the associated convergence zone. 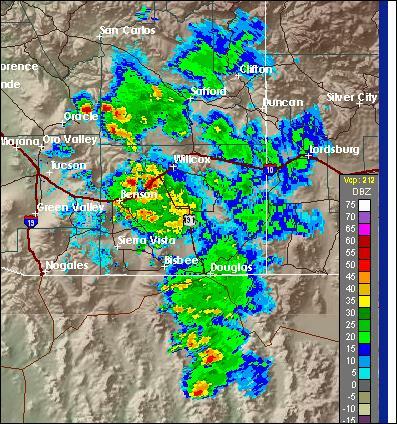 Thus, at 4 am (bottom) much of the Tucson area was experiencing thunderstorms and light rains. There was early morning wind damage and trees down just southwest of the airport with these storms. Here at the house we had 0.11"; 28 of 93 ALERT gauges had rain; TUS had only 0.03" but Atmo had 0.22". Heaviest amounts were with the stronger cells, mostly northwest of the airport. However, Manning Camp in the Rincons had 0.83" and Rincon RAWS had 1.18" (these were the late afternoon/evening storms) and DEQ at Country Club (between the airport and DM AFB) had 0.75". So quite a surprise early morning event here. Obviouly, there were problems with the WRF forecasts for this event, and I'll try to do a postmortem later today. The first tropical storm of the Atlantic season - Arlene - is off the east coast of Mexico. The storm has been found by recon aircraft to be a bit stronger than previously thought, and also located a bit further east. 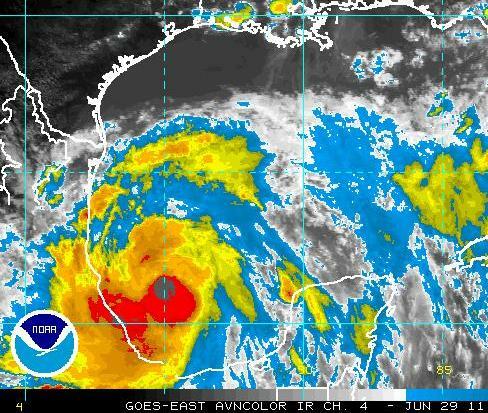 The Mexican Weather Service has issued Hurricane warnings ahead of Arlene. The NHC forecasts Arlene to move to the west-southwest and weaken, after coming ashore tomorrow morning. 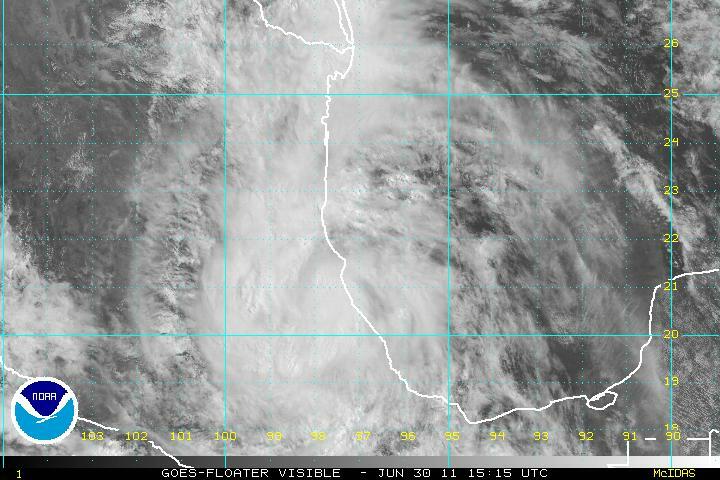 The tropical wave associated with Arlene is forecast to remain relatively strong as it moves west across Mexico. The NAM 700 mb forecast above (valid at 5 pm Saturday afternoon July 2nd, indicates a strong, inverted trough moving across the GoC - and perhaps a Pacific redevelopment of a tropical system south of the GoC. The forecast continues to indicate, as per an earlier post, an excellent setup for a deep surge of mT air into Arizona on Saturday. This, of course, is still 3 days away, and so we will have to watch the situation as Arlene moves into central Mexico. Yesterday afternoon there was quite a bit of thunderstorm activity in southeast Arizona and northern Sonora. For the first time this summer, a Cb was visible from the house. Photo taken about 4 pm is above - note that it is a "fuzzy" and not very impressive storm, but nevertheless the first one this month. The composite image for about 4 pm from NWS KEMX radar is shown above. The storm in photo is the echo located near Green Valley. The radar coverage is substantial, and June 28th goes into my weather log as the first day of the 2011 summer thunderstorm season. The NWS TUS observations indicated lightning to distant southeast at 4 pm and to distant northwest at 10 pm (the second lightning observation probably should have been to the southeast also, since there were no storms to the northwest). There was a large MCS over northern Sonora, as captured in the WV image above from 10 pm last evening. The outflow from this MCS was quite large and moved northward across much of southeastern Arizona, producing strong gusts, some sprinkles, dust, and put a smell of rain into the nighttime air. The outflow passed the airport (TUS) before 11 pm and the wind gusted to 32 mph; Ft. Huachuca had a thunder-sprinkle; and Safford had a sprinkle with a gust to 54 mph. The RAWS station at Guthrie had a gust to 57 mph (probably the first severe convective event of the summer in southeast Arizona). [Mike Hardiman alerted me that it takes 58 mph for a gust to be severe - so much for my memory!] The Rucker RAWS site measured 0.11" of rain. No rain was observed in the Pima County ALERT network. 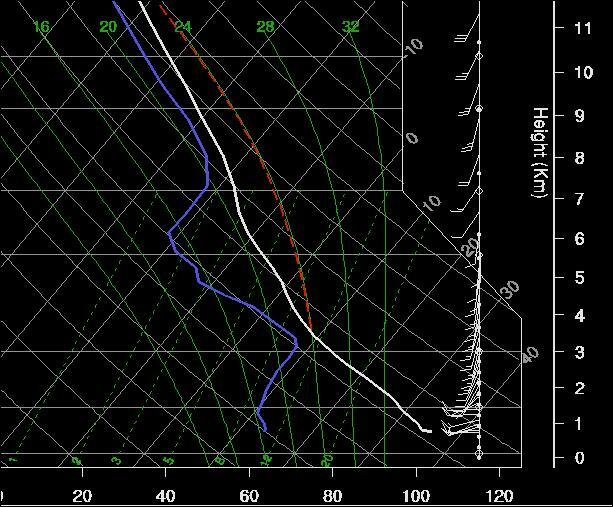 The TWC morning sounding shows that the moist, outflow air extends up to about 800 mb. The skies at sunrise were quite dirty and hazy, with both suspended dust and the increased moisture. The temperature here at house when I returned from my walk (6:30 am) was at 84F. So the outflow didn't bring much in the way of cool air, but it did result in another incremental increase in low-level moisture. Note that this is downdraft-recycled air and moisture, not a full-blown intrusion of the subtropical mT airmass. I can modify the sounding and get a small amount of CAPE this afternoon above 500 mb. 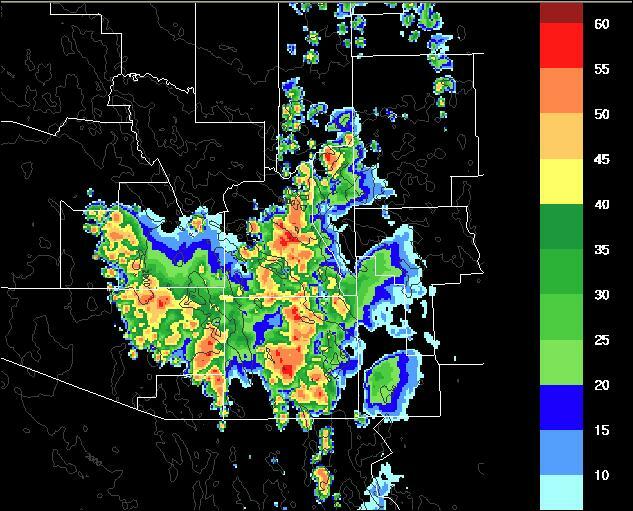 The WRF forecasts substantial thunderstorms to move northward across the Tucson area between 3 and 6 pm this afternoon. If this happens, the storms should be high-based and could produce winds reaching severe levels (56 mph or higher). The times series of GPS PW above shows the PW increase over the past two days and indicates that for the first time in a number of days that the TWC sounding and GPS data are in agreement over the amount of PW present! So, it should be an interesting day - more later, including a look at TS Arlene and how she might impact our weather. The tropical wave that has just moved across Yucatan is very moist and quite distinct (see 700 mb NAM analysis above and a morning visible satellite image below). I mentioned this wave in the post of June 24th as a possible player in the Holiday weekend's weather, and that still appears to be a distinct possibility. There is a low now spinning in the Bay of Campeche, and the short term model forecasts indicate that this feature may be a tropical storm before it moves ashore over eastern Mexico.The models all move this wave mainly to the west across Mexico, although the ECMWF appears to shear a piece of the wave nothward east of the Continental Divide. The 84-hour, NAM 700 mb forecast valid at 0000 UTC on Saturday July 2nd is shown above. At that time the wave is forecast to still be quite robust and approaching the GoC. Some of the models generate a new tropical storm with the wave, well south of the GoC. Regardless, this wave moving into and across the GoC, with associated thunderstorm complexes, should generate a substantial surge of GoC low-level moisture into southern Arizona, probably on Saturday. This would lead to excellent chances for storms on Sunday and the Fourth of July across southern Arizona. So, many interesting weather features to watch as the weekend approaches. 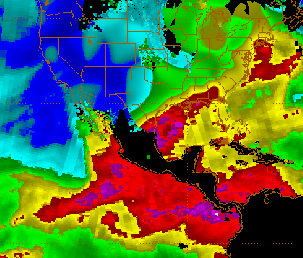 The large area of high precipitable water (see above) west of Baja has diffused horizontally and spread to the west and southwest during the last two days. While not as impressive as it was at time of the last post about it, it still appears that this pool of low-level moisture has begun (note its northward spread to southern California coast) interacting with the digging 500 mb short wave off the Northwest Coast. This morning skies here were partly to mostly clouded over with middle-level cloudiness (see visible image above). 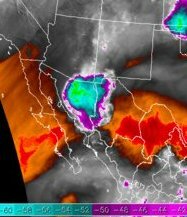 IR satellite loops indicate that these clouds are debris from yesterday evening's deep convection over the mountains of Sonora. The debris cloudiness spread westward to the GoC and then turned north-northeastward, advecting into Arizona. The El Paso morning sounding (12 UTC 28 June 2011 - see above) remains fairly dry (PW about 19 mm), but winds below 700 mb are quite strong and from the southeast. 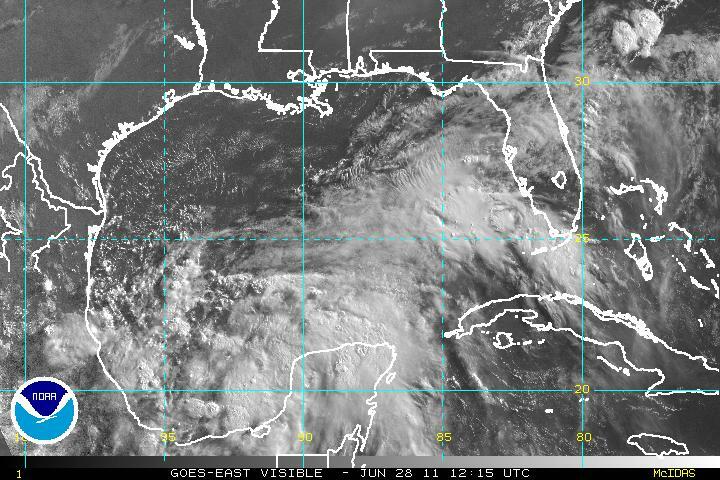 Something to watch, as the tropical disturbance in the GoM is very moist. The morning sounding from NWS TUS (above) is very dry with indicated PW of 13 mm - however, the data are too dry wrt GPS data by about 5 mm (note that there are no local GPS data with which to compare El Paso's PW). There is a shallow layer of south-southwest to south-southeast winds around 500 mb, which has brought the Mexican cloud debris overhead. The winds are westerly above and L/V below this layer. Unfortunately, there are still no soundings from Guaymas, and this morning Mazatlan has also gone missing - leaving a big data void right we'd like to know what's happening. The forecasts from the Atmo, high-resolution version of the WRF model (from run initialized at midnight last night - above) are very interesting. As the Pacific short wave moves ashore tomorrow into the Great Basin, the WRF forecasts a continuing influx of low-level moisture from the GoC (see forecast of PW above, which is valid at 4 pm tmorrow afternoon (Wednesday the 29th). The model predicts a very substantial increase of PW across all of southern Arizona, with the Tucson value predicted to reach 42 mm! The WRF's total predicted precipitation is shown above for the period ending at 1200 UTC on 30 June. The model forecasts 1/2 an inch at Tucson (most of which falls during thunderstorms on Wednesday afternoon). This would be a the most substantial rainfall in many months. Hope that the model forecast verifies. The longer term situation is also very interesting - I'll address this later today after a dentist appointment. I note that the NWS forecast looks very summer-like, with Tucson metro area POPs of 10 to 30% for each of the 12 12-hour forecast periods beginning tomorrow. We added an array of 16 solar panels (above) to our roof in January of this year. Since the system went on-line in early February, we have produced more electricity than we've used at the house. However, with the air conditioners now running much of the time in both houses, we will will probably have an electricity bill to pay in July. Our orientation is less than optimal, with the panels pointed off somewhat east of south, as shown in the inset. 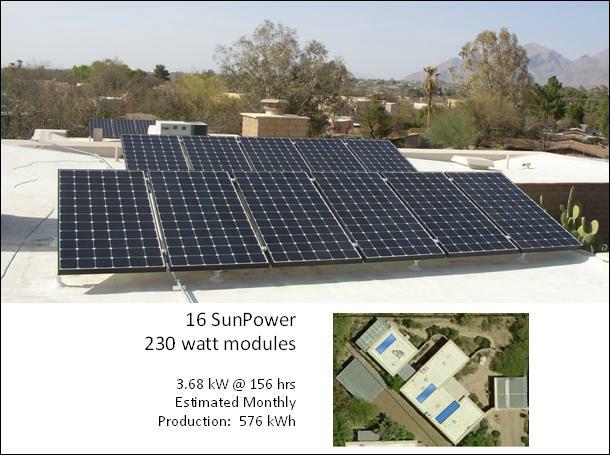 However, since this year has been nearly cloudless, they've been operating in almost perfect solar generating weather. 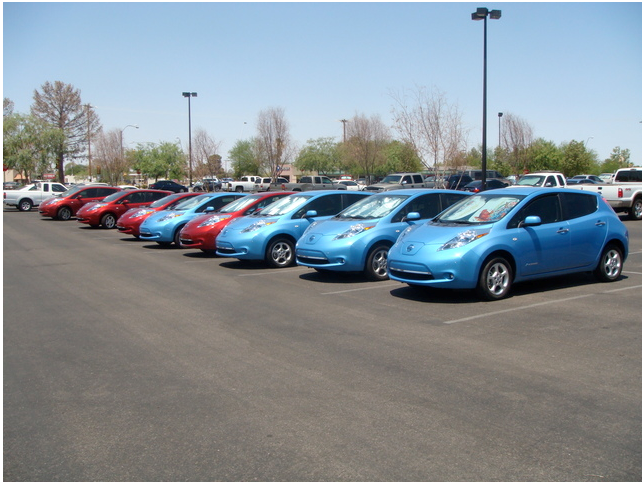 A week ago Saturday we went to a breakfast organized by a number of electric car enthusiasts - all owners, or almost owners, of Nissan Leafs. Tucson is one of five test markets and over 100 of these have been delivered here. Katie has ordered one for her commuting to campus. Hopefully, it will be delivered before the Holidays this Fall. At one point during the breafast there were 10 Leafs in the line, with numerous curious folks coming by to gawk at them. When we have the Leaf it will be a zero emissions vehicle, since all the electricity needed to operate it will come from our solar panels. We hope that when all of this is done, that the panels will power the car, plus supply about 50% of the electricity we use in the houses (we have a small casita behind the main house from which I run Squid Ink Books). Sunday was another hot and dry day here in southeast Arizona. 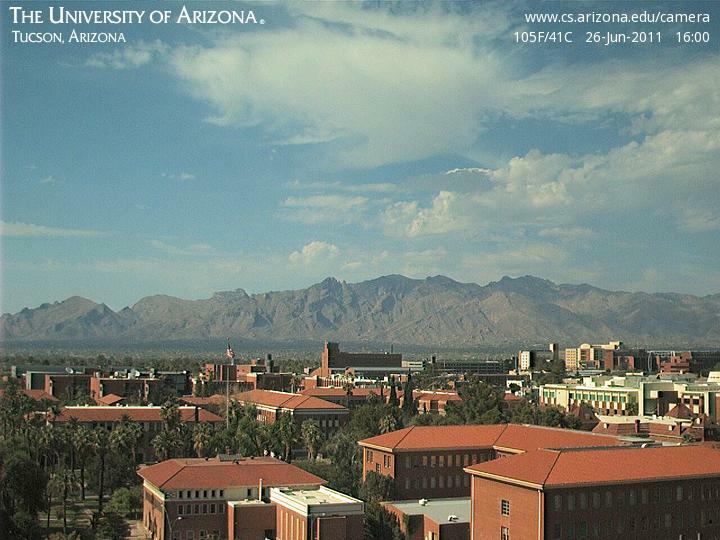 High temperature in Tucson reached 109F; the hottest day yet this summer. Top photo shows very-high based cu over the Catalinas and just a hint of some virga that occurred during the mid-afternoon. The visible satellite image at bottom shows that there were some small thunderstorms along and just south of the border at 6 pm MST. I was surprised to see that NWS TUS added 10% POPs for precipitation to their afternoon and evening forecasts for theTucson metro area. There was of course no rain, but it has been exciting to see clouds the last couple of days. The U of A Atmo's high-resolution WRF model, run at midnight last night (Saturday night June 25th), forecasts are interesting this morning. This is the first summer run that forecasts weak convective echoes as far north and west as eastern Pima County - thus, I thought they were worth showing. 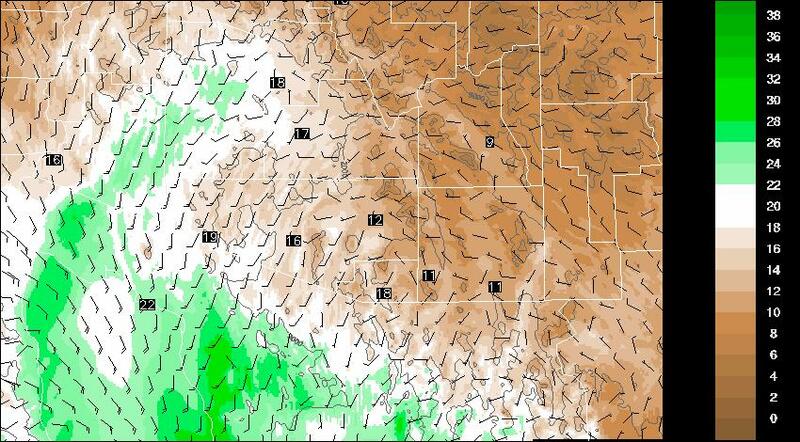 All of the images above are WRF forecasts valid at 6 pm MST on Tuesday, 28 June 2011. 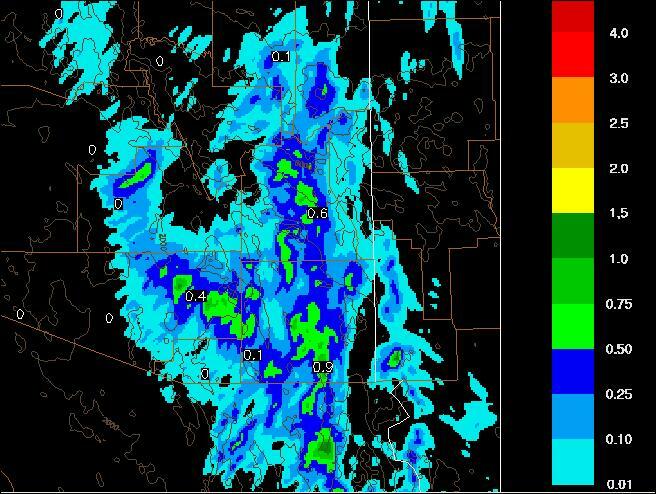 The PW forecast (top) indicates a general evening push of higher PW into southern Arizona, with a nice blob of higher values moving across the Tucson area - values reach to just over an inch. 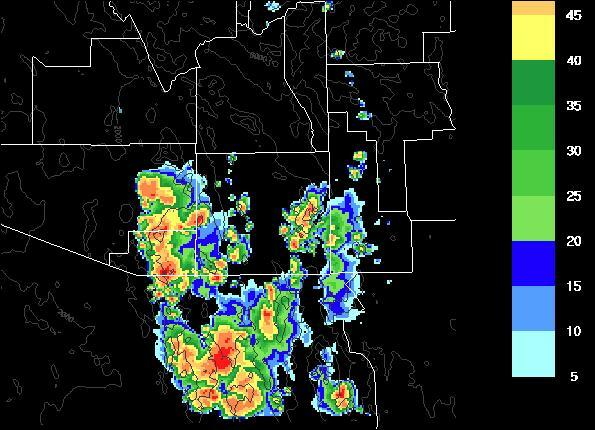 Composite radar forecasted at the same time (middle) indicates weak convective echos near the Catalinas and Rincons, with some thunderstorms off to the northeast over higher elevations. 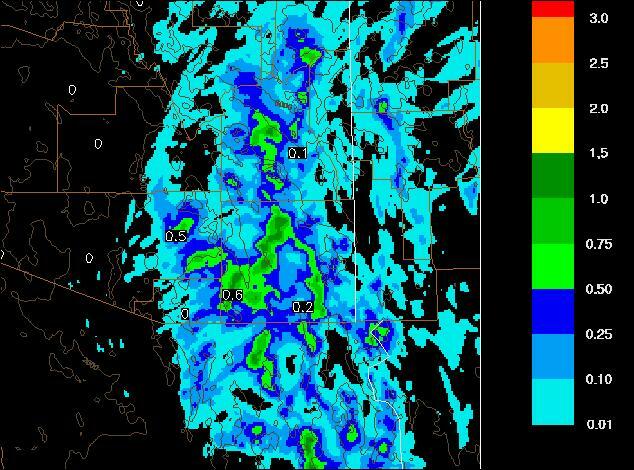 The forecast of total accumulated rainfal at 6 pm MST on Tuesday (bottom image) shows a forecast of light sprinkles at the higher elevations of southeastern Arizona - so, the model essentially forecasts high-based convection and virga sprinkles - some possiblity of CG lighting is also indicated, especially off to the northeast of Tucson. High temperature reached 107F again yesterday afternoon at NWS TUS. 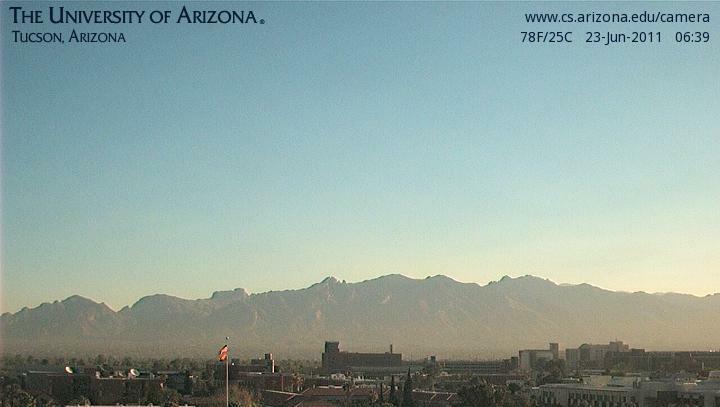 During the middle to late afternoon there were actually cumulus clouds visible down to the south of Tucson, along with some towering cumulus off to the far southeast, in the Borderlands. I note this morning that the blistering heat continues to deepen the heat low in the lower Colorado River Basin - with 24-hour pressure falls this morning of 1.5 to 2.0 mb common over southern and western Arizona. Largest fall I noticed in Arizona was 2.1 mb at Nogales. The two images above show blended PW over the eastern Pacific - the top image is from 1200 UTC on 23 June and the bottom is image is from 1200 UTC this morning (Saturday 25 June 2011). It appears that even though Beatriz was short-lived, the storm's remnants have helped push a large mass of moist, lower-level air both up the GoC and also to the west of Baja. This has been quite a substantial development - some areas west of Baja, and north of 20 degrees N, have experienced a 48-hour increase in PW of around 45 mm! If this great blob of moisture continues its northwestward push for the next couple of days, it will be well-positioned to interact with a deepening 500 mg trough forecast to dig southward off the west coast. The two images below are the 120-hour forecast of the GFS operational member for 500 mb and the surface - valid time is 5 pm MST next Wednesday afternoon. The model forecast indicates the 500 mb short-wave to be inland, crossing the Great Basin and butting heads with the large central US anticyclone. The model forecasts moisture to be pulled northward from low latitudes as the two features (one spring-like and one definitely summer-like) interact. This interaction brings the first chance for summer-season storms into parts of Arizona. The model indicates that the forecast storms are developing within moisture pulled north from the GoC and from the remnants of Sierra Madre Occidental diurnal thunderstorms. Thus, the possible role of the moisture push discussed above is not obvious yet in the model forecasts. The 500 mb analysis in previous post shows that the anticyclone over the Southwest still has a distinct connection to the Pacific subtropical high. However, this morning's 1200 UTC NAM forecast quickly makes the eastern portion of the 500 mb high dominant, so that by 36-hours (above) it has clearly become an over-the-continent lobe of the Atlantic subtropical high. This lets the flow around the bottom of the anticyclone have a fetch across Texas, northern Mexico and then north into Arizona. While the 700 mb level is forecast to remain quite dry, there appears to be enough diurnal convection in Mexico occurring each day, that the southerly flow forecast around the anticyclone may bring residual moisture from decayed convective towers northward within a shallow layer centered around 500 mb. Thus, some high-based convection is possible over the mountains of southeast Arizona during the next several days. 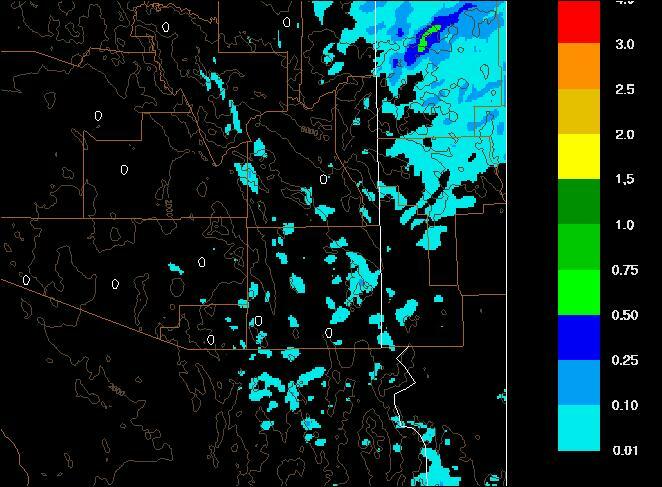 The early morning run of Atmo's high-resolution version of the WRF model actually forecasts some convective radar echoes on the Arizona side of the border tomorrow (Saturday the 25th) at 5 pm - see below. In the longer term, there is a pronounced tropical wave (in the past referred to as an easterly wave) over the Caribbean - see GFS mornng analysis below. By 132-hours (Wednesday afternoon the 29th) this features has pushed westward across southern Mexico and Central America and is in the far eastern Pacific (see bottom figure) - thus, having some potential to be a player of interest to us during the last half of next week. So, even though the blistering heat continues over southern Arizona, there are some things to keep an eye on this weekend! The seasonal transition to summer conditions is well underway, and there are quite a few interesting things to note this morning. The two visible images above are from 0000 UTC yesterday afternoon. Note that there was weak convection just south of the border near Cochise County. 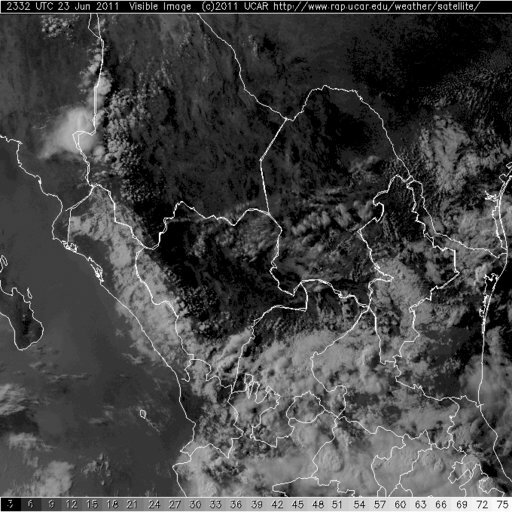 There was deeper, and more impressive, convection along the divide of the Sierra Madre Occidental in southern Sonora. However, the lower image shows that widespread deep convection and cloudiness remains primarily to the south over central Mexico - a long way away. Above is a quick and dirty 500 mb analysis for 1200 UTC this morning. Shown are streamlines and 2 degree C isotherms, along with two weak trough lines. Currently, flow around the Southwest anticyclone is mostly off the Pacific - thus, very warm and dry. There are large areas already present at -4C and a bit warmer. This is bothersome, since last summer seems to have been one with unusually warm 500 mb temperatures persisting over the Southwest. Given the mediocre rainfall last summer, I certainly hope that we'll have cooler middle-levels return this summer. The forecasts are interesting and I'll discuss them in Part 2. PW and surface dewpoints have been gradually increasing, even with winds through the troposphere being westerly. Shown above is the TWC 1200 UTC sounding this morning (24 June 2011) with the Univ. of Wyoming analysis indicating 8.08 mm of PW - Not much. But, remember these data are from the unreliable NWS RRS sonde. Contrast with the morning sounding taken at Phoenix (below). The Phoenix data are from a Vaisala sonde and indicate that PW up there is more than double the amount here at Tucson. A comparison of GPS PW with the TWC raob values (from ERSL) is shown above for past 5 days. The soundings at TWC have mostly been too dry recently, both morning and evening flights. As we start worrying about whether or not there is CAPE present (hopefully not too far in the future now) over southeastern Arizona the problems with the RRS data will again start impacting the short-term forecasting process. Hopefully, the bad RRS RH sensor will be replaced within a year or so! The surface plot for 1500 UTC illustrates this surge (note that surface dewpoints have diminshed considerably as the day heated up). The 2100 UTC PW chart from NESDIS (below) shows high PW up the GoC and elevated PW over southwest Arizona. So, apparently Beatriz was able to push a weak surge of low-level moisture all the way up the GoC, even given its brief, pathetic life. The following url has a nice loop showing the surge up both sides of Baja. The high temperature reached 108F at TUS yesterday afternoon, Wednesday June 22nd. This was the 16th day of 100F or higher temperatures at TUS in May and June, and the 14th such day of June. Here at the house, early morning temperatures during June have been quite pleasant, with early month lows in mid to upper 50s and recent lows in the mid 60s. Morning lows during June here have been generally 10 to 12F lower than those at TUS. Skies at sunrise were a bit dirty this morning, with dust and haze hanging in the ar. The skies far to the northeast were smokey, with an orange to brownish orange hue as the sun rose. The early run of the U of A, high-resolution version of the WRF model today forecasts weak pulses of increased PW (but values staying around an inch or less) pushing north from the GoC. 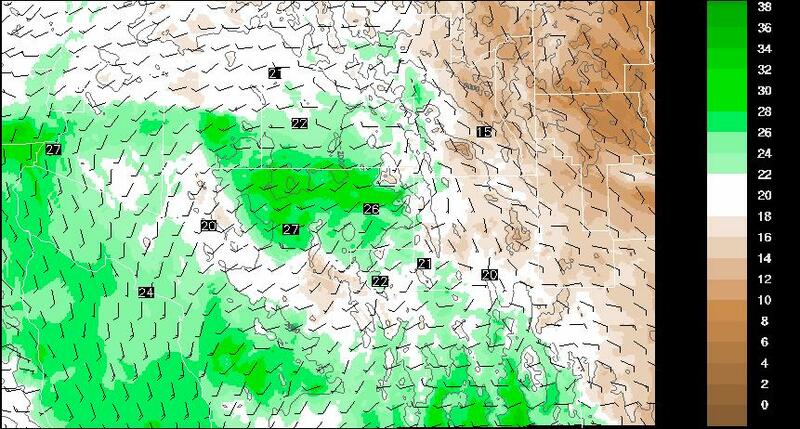 Above graphic shows surface winds and PW forecast for noon today. 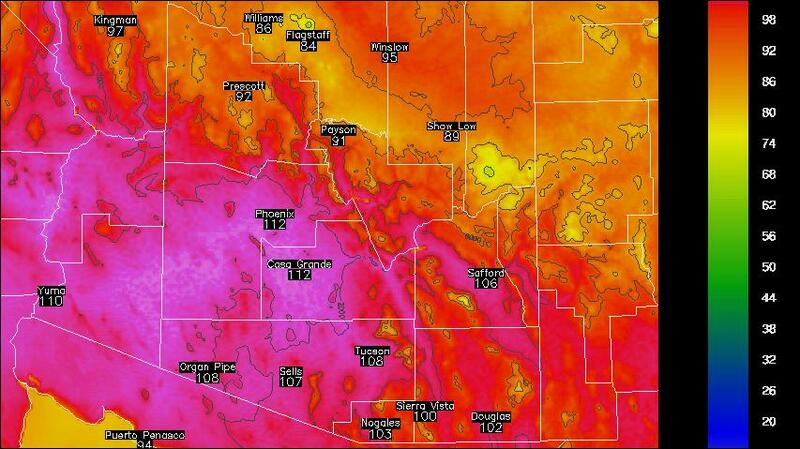 The WRF model forecast keeps the heat on across southern Arizona through the weekend. The graphic above shows the model forecasted 2-m temperatures at 3 pm on Saturday afternoon, the 25th of June. Ugh! How Quickly Forecasts Can Change! First Eastern Pacific TS of The Season? If Only We Had Some Low-Level Moisture!